“Leaders live by choice, not by accident.” Mark Gorman, author. Choice. A simple, easygoing word which leads most of us to trivialize its importance. But nonetheless it holds enormous power in the exercise of Leadership as well as life in general. In a recent Leadership course, I gained a powerful perspective from the following classroom experiment relating to ‘Choice’. The experiment required of us the following. 1. Identify what there is for you to do in your life that you feel obligated to do, or that you are doing based on a set of reasons for doing them, and write it down. 3. Now check and see whether your experience of the item occurs for you (shows up for you) differently. One aspect in my life that occurs to me as an obligation is, ‘Hang onto my current job, work profile and industry’. I was taken aback by the remarkable shift in the way the situation occurred for me by the mere change in the language as above. I could see that when I exercise ‘Choice’, it is intrinsically me, my inner convictions and I start ‘owning’ that choice; it occurs less burdensome. I start feeling heightened energy, passion and confidence. I can sense more possibilities and way forward opportunities apart from an intrinsic commitment to do the best I can. Contrast this with when I used the language of obligation and the burden that brings in, constraining possibilities and pathways. I then see myself in a space of forcible acceptance, fearful of consequences. I go through the motions, rely on instructions to proceed, avoid risks etc. I see a drag and loss of energy. I started seeing the power residing within the ‘language of Choice’. I recall a couple of situations in which the way I perceived making a choice impacted both myself and others in a positive or negative way. One time when I had to treat my family out to dinner, my wife and daughters left the choice of selecting the restaurant to me. Post dinner, my wife remarked that she had not enjoyed the Italian cuisine all that much and how she wished, I had chosen an Indian restaurant. I remember reacting back angrily as to what had stopped her from giving this preference earlier on. I then tried to justify my selection based on good word of mouth feedback of friends. Basically I ended up not taking responsibility of my own choice and putting the blame on my friends instead. To evade criticism of my choice, I had painted myself into a ‘victim’ corner. Another time, my family left the choice of selecting which movie we should go to. After the movie, my wife and daughter were unanimous in rating the movie as terrible. On this occasion however, I stood firm as I declared, “Because of its philosophical insights, I wanted all of us to watch and learn from this movie.” Without really realizing it at that point in time, I showed up as having made a choice of my own free will and held the courage to take responsibility for it. As I articulated my choice in this manner, I felt empowered. 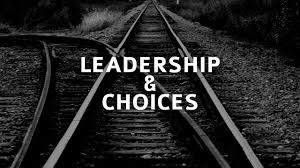 Do we realise that at its very essence, Leadership is a choice? Just as is living life. Everything about Leadership, as with life, begins with a choice. A choice which we make. In literature, Leadership and decision making appear to be near synonymous. We tend to overlook the fact that any decision really comprises of a chain of small but significant choices. Even when we bring in our biases, perceptions and assumptions and rationalize and justify based on these, that is our choice too. Our choice, and the corresponding decision flowing out of that, further gets coloured and shaped (or shall I use the word forced?) by our positional, inter-personal or cultural compulsions. We remain largely unaware of this aspect, falsely believing that how the situation occurs for us is how it really is and that our reaction is correct and logical. We fail to see that we in fact have got onto rails and are unable to exercise any freedom relating to other possibilities available to us to deal with what is at hand. A far cry from effective leadership which is all about opening up choices and possibilities, not limiting them. Richard J. Leider, the author of the international bestseller, ‘ The Power of Purpose’ writes that in twenty years of his interviewing elderly leaders aged over 65, he discovered something profound relating to ‘Choices’. To his question, “If you could live your life over again, what would you choose to do differently?”, he heard the articulation of three themes getting repeated over and over again. •	“I would choose to be more courageous, take more risks; I played it too close to the vest”. •	“I would choose to be clear, far earlier, on what my purpose was in life”. 1)	“Being A Leader And The Effective Exercise Of Leadership: An Ontological / Phenomenological Model” by Werner Erhard, Independent & Michael Jensen, Jesse Isidor Straus Professor of Business Administration Emeritus, Harvard Business School. 2)	“The Power of Purpose” by Richard J. Leider, May, 2010.